When it comes to Pokémon, I tend to prefer cute ones to ugly ones. As such, I'm not the biggest fan of Pokémon Black 's Eelektrik. 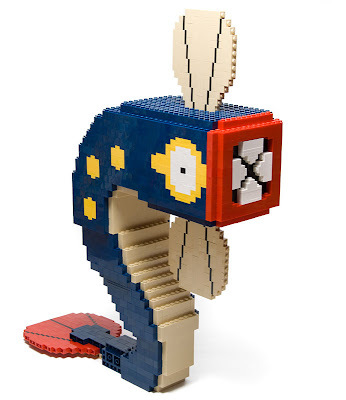 Given that, I'm a bit surprised that I like Filip Johannes Felberg's LEGO Eelektrik (below and here) as much as I do. To see Felberg's blocky takes on Pokémon Black 's Basculin, Joltik and Whirlipede, check out his Flickr photostream. You know, I REALLY wanted to like that evolutionary-chain, but I ended up really NOT liking any of them...this lego one, though...his jaggediness is adorable.